The Northland challenge is a team building/ community service project conceptualized by Northland Controls, one of North America’s preeminent system integration firms. The 2016 challenge raised $17,000 plus the labor to install solar systems for several homes on the Bear River Indian Reservation in northern California. When the challenge was over I woke up without my group coffee meeting and without my new challenges for the day. I was reintroduced to the noise, people, and technology that I had escaped during the 8-day adventure and it required a noticeable effort to slip back into the real world.The solar installation wasn’t our only accomplishment. Our trip began 2000 miles away where I was paired with a stranger and given basic instructions for 8 days of navigating through the desert by map. GPS was forbidden. Every day was 3-8 hours of driving backroads and trails, followed by various “challenges” that included hiking, horseback riding, camping, police officer visits, lake swimming, and a dip in the Pacific Ocean. As I’ve returned, I’ve taken some time to reflect on my experience and it’s clear that real value of the challenge is the amazing relationships that were forged through shared experiences. Thinking about the experience took me back to some years when our company had “challenges” of its own. Lack of communication had led to mistrust between our sales and operations departments and the situation finally came to a head. Several key employees quit and those that stayed weren’t the ones who I would’ve necessarily kept. The last straw was when I realized that our star sales person had to be fired. Sound familiar? I took the group that was left and started getting them together. First there was a luncheon, then a company team-building outing. We started having daily team huddles and a refocusing on our core values. As trust developed, they started to share more. I created a forum to discuss issues, based on the book Traction by Gino Wickman. Before I knew it, we were identifying problems, discussing them honestly, and figuring out ways to solve them together. Our team started to grow through these shared experiences. By accepting and respecting their diverse opinions, they began solving real problems. Our team went from closed, scared, and untrusting to honest, trusting, and dynamic. 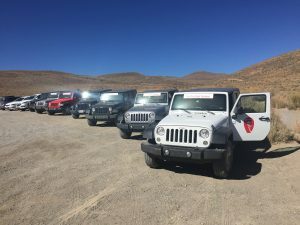 I’m not saying you have to go out and spend eight days together in the Southwestern desert to figure out the value of team building – unless you’re an amazing company like Northland. But you can find ways to give your employees a chance to be a team, to work as a team, and to bond as a team without an 8- day trip. Even when it isn’t work related, it will improve their ability to think rationally and strategically. When you do things together you create experiential bonds that last a lifetime. Team building is the instrument that allows your employees to work together to solve problems, to work harmoniously. Teamwork really is beautiful music, hopefully you’re taking the time to listen for it.